Real conversations are unpredictable and unscripted; ideas, questions, and insights emerge as the exchange develops, leading the discussion in unforeseen directions. For the past nineteen years, New Music New College has fostered a conversation about contemporary music and performance, a conversation that has included the New College community, the greater Sarasota-Bradenton community, and world-class musicians of every stripe. NMNC began as a response to a challenge posed by the Ringling Museum. In 1998 the Ringling mounted a major exhibition of Joseph Beuys’s multiples and invited us to explore the connections between Beuys and the music of John Cage. The result was a performance of Cage’s Song Books, in which each performer followed an independent course through the galleries, while the audience was invited to do the same. The experience for both performers and audience was exhilarating, so much so that the Ringling promptly invited New College to respond to 1999’s “Blurring the Boundaries,” a comprehensive survey of installation art. Performing near and even inside the artworks, we presented Pauline Oliveros’s Sonic Meditations, with most selections involving audience participation. Again, the experience was overwhelming, and seemed to catch all of us by surprise. 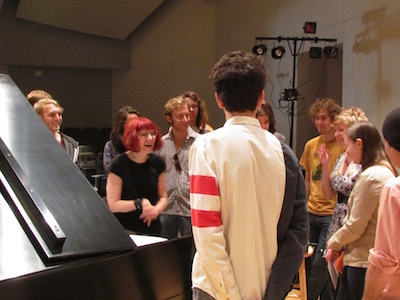 Looking back on these first performances, the foundational principles of NMNC can be seen: experimental performance creates the opportunity for dialogue; new music comes alive when presented in the appropriate performance space; short and intense performances have maximum impact; and the conversation about contemporary music is richer when it involves the community as well as students, faculty, and staff. 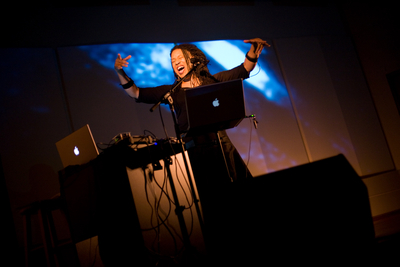 In the years that followed, experimental music provided an experiential frame for exploring questions such as: When is music speech? Speech music? (“Speech Acts,” 2000) How does musical performance shape the social experience of performers and audience? (“Social Studies,” 2003) How can composition be approached collaboratively? (“Hocket Science,” 2004) During these early years, NMNC offered events only once or twice a year, yet the audience of adventurous listeners expanded, as did the conversation. In 2006 we decided to bring guest artists into the mix and established our current five-concert format. 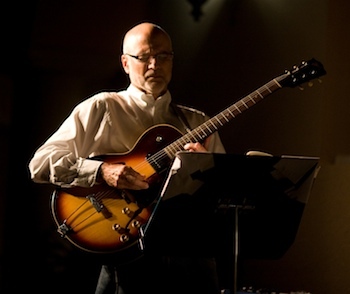 Since then NMNC has welcomed some of the finest musicians working today, such as the JACK Quartet, vocalist-composer Pamela Z, pianist Kathleen Supové, Mantra Percussion, and cellist Darrett Adkins. These musicians have expanded each season’s breadth of vision, and have complemented the performances by New College students, faculty, and staff. Without exception, these guest artists have been thrilled by our audience and have enjoyed becoming a part of the intellectually and musically adventurous NMNC community. While the concert series is the most visible aspect of NMNC, it truly is the tip of the iceberg. Each concert is the focus of educational activities, including Artist Conversations and panel discussions. There are courses, such as “Experimental Music in Theory and Practice” that have led to dozens of projects by students (now alumni) such as Silas Durocher, Erica Gressman, Taylor Briggs, and Sarah Moone. New College students and staff have presented papers on NMNC projects at academic conferences, and our projects have been documented in articles in such journals as Perspectives of New Music and TDR: The Drama Review. For our current season, we’re bringing in new artists—Sō Percussion and Ensemble Dal Niente—and bringing back Wet Ink Ensemble, Mark Dancigers, Aaron Wunsch, and George Lewis. Eliza Ladd working with New College students will explore movement and sound in New College's Black Box Theater, and Dancigers will create new electronic works with students. Our Pre-concert Talks are 7:30 (2:30 for the Sunday matinee concert in February), to allow audience members who arrive a bit early to catch a preview which will emphasize core themes and context. For those who would like a deeper immersion into the music and greater dialogue with the musicians, we offer our Artist Conversations, now on Thursdays at 5. And stick around after the concerts—we have free post-concert receptions for our Sainer events, where artists and audience can interact and continue the conversation (at Club Sudakoff and the Koski Plaza the receptions will be concurrent with the concerts). As we begin this new season, I want to thank our many supporters, our donors, our media sponsors, and of course, New College of Florida for making NMNC the vital organization that it is today. And let’s all thank NMNC’s Producer, R. L. Silver, for his brilliant work behind the scenes and on stage, and for helping us maintain the highest technical standards in every performance. What will the future bring? Join our conversation and together we’ll find out! Click here to like the New Music New College Facebook page! New Music New College commits to the We Have Voice Code of Conduct for the Performing Arts. For more information, click here. Want info on upcoming events? Want to be added to our email and/or snail-mail lists? Contact us by email at events@ncf.edu or phone (941) 487-4888. Have a response to one of our events? Email feedback@newmusicnewcollege.org. Paid for in part by Sarasota County Tourist Development Tax revenues. Support for this season was provided by a grant from the Andrew W. Mellon Foundation.